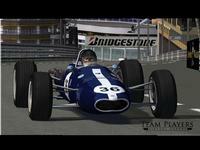 We are pleased to announce the release of our Gurney Eagle Tribute for rFactor. Over the last few months we have been quietly working on our tribute to Dan Gurney and his 1967 Eagle. This version of the car was inspired by my meeting Dan Gurney at the Daytona 24 Hour Race. We were there with CXC Simulations showing our Grand Slam (Grand AM) mod. After Meeting Dan Gurney he gave me an autographed copy of his book "Dan Gurney Racing Cars" which has the Spa winning Eagle on the cover. I was inspired to redo our existing Eagle into the Spa version of this car and create a tribute to this beautiful machine and the man who created it. You can read the complete story in the intro of the Eagle Service Manual we have included in the mod. This tribute includes an all new interface and menus to give that 1960's look and feel. We have included a folder in the mod called "EXTRA", It has the "Eagle Service Manual"
which has valuable information about the physics. We have also included the paint templates and other information so please take the time to go through it. There are currently no setups for Gurney Eagle Tribute. Add a Setup. There are currently no car skins available for Gurney Eagle Tribute. If you are a painter you can share skins for this mod via the Car Skins area. Visit the Spray Booth for painting tips & tricks. This release is the best f1 67 mod out there by far. Actually it puts to shame the f1 classic mod by slimjim and f1 67 reloaded by the DRM team in both realism and physics. Take a lap time at spa 67 for example. The real world lap record was 3:31 secs. This is the only claasic mod where the lap time is as close to real life as it gets. This says it all. MirrorPos=(0.00, 0.70, -1.000) the mirrors will be correct. Any news about the reversed mirror fix? Great mod, but too easy to drive. Nothing like the handling in gpl. I would really love to find a league that is or might be considering running this mod. Imagine painting up some cars to resemble Coopers, Brabhams, Ferraris, Loti, etc etc. (I actually have about 25 cars/drivers already done for my own offline pleasure). Running against humans on some of the classic 60's era tracks would be amazing and a great way to get 'in the mood' for the rF2 historic cars and tracks. Full throttle at no load will blow it up. Try to keep under 10,500 rpm. How do I stop the engine from blowing?! Can't get it out of the pits!